Dell EMC announced End-of-Life of Centera for March 2018. However, replacing your legacy archive with another proprietary platform only shifts the problem of vendor lock-in to the future if the Centera CAS API remains in use. The new approach of 'Software-defined Archiving' helps you to overcome limitations and disadvantages of legacy archiving silos. You can turn the situation into an opportunity to unchain your business data and change to a future-proof archiving solution! iTernity Compliant Archive Software (iCAS) helps you to unchain your data. The enterprise archive and data management software enables organizations to store critical data in a secure and cost-efficient manner. iCAS provides Software-defined Archiving using industry standards and open interfaces for maximum flexibility. The software solution ensures long-term security, availability and integrity of archive data. This is fundamental for business continuity, risk mitigation and compliance with regulatory requirements. iCAS meets highest security standards and complies with numerous legal requirements (e.g. SEC Rule 17a-4, GDPR, SOX, HIPAA, BASEL III, etc.). The iCAS middleware layer supports any storage infrastructure including cloud platforms. iCAS is designed to be the central archiving backend for various data types and holds certifications for 120+ leading applications that manage business relevant content (email, documents, voice, images, videos etc.). Download Flyer "Replace hardware silos"
To enable the transition to a modern archive, iTernity assists in the migration of existing data to the iCAS platform. This is done with established tools and processes. It includes sanity checks of the existing data and an audit-trail with comprehensive end-to-end logging. The use of specialist tools enables data migrations at a fraction of the cost and time compared to application migrations. Ask us for details! As a member of the HPE Partner Ready for Technology program, iTernity supports a complementary partnership with HPE to deliver comprehensive and cost-effective data storage solutions that comply with highest security standards. HPE Complete is a resource enabling the purchase of best in class products with the added reliability of Hewlett Packard Enterprise’s assurance for a complete validated solution. iCAS is part of the HPE Complete Program which enables customers to purchase iCAS directly via HPE´s global price list. You can find more information in the HPE and iTernity brochure. 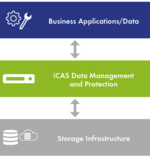 Combined with HPE Storage and Servers, iCAS provides an open, flexible, and expandable long-term archiving solution for securing and protecting your business data. iCAS is the secure backend platform for the SAP archive. The Centera extension would have been 3x the price of the iCAS implementation. Existing storage infrastucture could be leveraged by the customer which led to more efficiency in the datacenter. Central archiving platform for more than 300 different archiving projects within the company including SAP, Banking, historic archives etc. Included the compliant migration of data assets from Centera. iCAS helped a large German university hospital to enable a secure and cost efficient storage for steadily growing data. The hardware independence and flexibility requested by the customer was gained with the software-defined approach of iCAS. iCAS is the central archive storage for all SAP data. It replaced EMC Centera and has been a robust and cost-efficient solution, providing greater flexibility for adding additional use cases and hardware choices. Do you want to discover all the benefits of iTernity iCAS?